Allows to manage the list of distributors. Makes a copy of the selected distributor into the copy buffer. Pastes the distributor from the copy buffer. Also, you can move distributor items up and down by using the drag and drop feature. 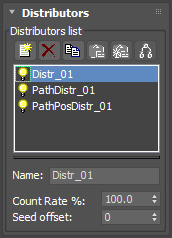 To the left of each distributor, you can see the bulb icons that allows to enable or disable distributor. This field allows to specify the distributor name. 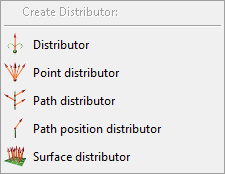 Specifies how many paths in percent to calculate using the selected distributor. Specifies a randomization value for selected distributor.